The North Carolina Pro-Am Summer League continued this week at N.C. Central University, with several Duke stars in action. Amogh and Jake were on scene July 28th and 30th. 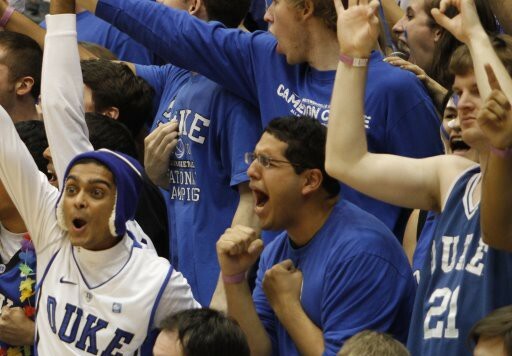 Jon Scheyer, Chris Duhon, and Mason Plumlee—teammates? Yeah, we wish. On Tuesday night, NCCU’s McDougald Gymnasium felt the presence of several current and former Blue Devils. Jon Scheyer, Kyle Singler, Mason Plumlee, Ryan Kelly, and newly minted walk-on Casey Peters represented the modern Devils, while former guard greats Chris Duhon and Sean Dockery (remember VT?) returned to the Triangle for some elite pickup competition. In Tuesday’s penultimate game, Kyle Singler and Team E-net gutted out a 55-50 comback win. Somewhat alarming—Kyle showed noticeable discomfort and appeared bothered by his elbow. He quickly taped it up, but it clearly affected the rest of his night. Thus, this was not a vintage Singler performance, but the projected All-American should be back to the hardwood soon. The final game was the night’s best. Team Duhon, undefeated in eight outings, was tested by Team WR Starkey, led by Word of God (Raleigh, NC) star CJ Leslie and Anthony Greenup of the Harlem Globetrotters. Team Duhon’s roster was a veritable Duke all-star team, with Scheyer, Mason, and Dockery joining the namesake Knicks point guard. The Blue Devil connection was scintillating; Duhon consistently found Plumlee and Scheyer for easy buckets. Mason was exceptional around the rim, grabbing boards and finishing strong on almost every touch. Needless to say, Duhon and company easily built a commanding lead by halftime. After wholesale substitutions in the third quarter, Starkey’s Leslie led a furious comeback with a series of thrilling dunks and alley-oops. At crunch time, however, free throw shooting ended up sealing the deal for an 89-80 Duhon win—how Duke-esque! The action continued on Thursday, with Ryan Kelly and Team Starkey facing Team Hendrick, led by UNC alumnus David Noel. Kelly led his team admirably in a losing effort, collecting 26 points on 10-18 shooting, 6 rebounds, 5 assists, and 3 blocks. He displayed a deceptive quickness in defending the stronger Noel, a skill that will earn him minutes in K’s system. After a slow first quarter, Kelly showed off his midrange stroke, hitting a number of fadeaway jumpers from about 15 feet. He was the most impressive player on the floor. Thursday’s second game featured sophomore Miles Plumlee, playing for Team E-Net. Miles has obviously been in the weight room, and his added strength translated to a solid performance—24 points on 10-15 shooting, 11 rebounds, and 2 blocks in a loss. He also converted one of two 3-point attempts. The good news is that Miles was aggressive on offense. He was the focal point of E-Net’s attack, often backing down the defender and getting to the rim (see video below). However, Miles was unmotivated at times. While this can be partly attributed to the lack of competitive play in these summer leagues, he will have to exhibit more effort on defense in order to get minutes in our crowded frontcourt rotation. Crazie Notes: CJ Leslie has loads of talent but a bad attitude—he often looked disinterested and frequently argued with the refs. Is this why he’s being recruited by UNC?… Speaking of which, why was Roy Williams at the Pro-Am on Thursday while the AAU Nationals are in full swing in Orlando? Every major D-I coach is there… David Noel was hilariously petulant, even earning a technical for repeated ref abuse. Isn’t this just summer league?…PJ Tucker still has serious game. The former Texas star and elder statesman of the league threw down a furious dunk on Miles to the delight of the Tar Heel-laden crowd…Duhon showed up on Thursday, chatting with a few friends before leaving 30 minutes later…Will Seth Curry make an appearance? He’s listed on the Starkey roster, but hasn’t yet played in a Pro-Am game…Singler missed E-Net’s Thursday game, hopefully nursing his elbow. The highlight of the night? Miles throwing down. With authority!